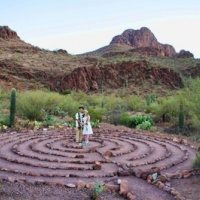 Fall in love with Marana, Arizona as the perfect destination for your wedding. Valentine’s Day is that perfect chance for you and your special someone to let the sparks fly. And if, by chance, you’re among the many couples who get engaged on February 14, Marana’s got you covered for that. With a variety of beautiful wedding venues offering all kinds of unique settings for your ceremony and reception, you may find yourself as in love with this Town as you are with your betrothed. 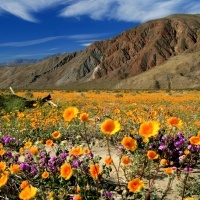 February is one of the most beautiful times of the year to get out and explore Marana. 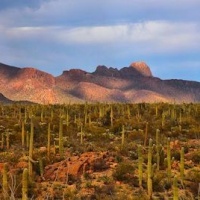 With mild days and cool evenings, this is the ideal weather for hiking into the Tortolita or Tucson Mountains and experiencing all that our stunning Sonoran Desert landscape has to offer. 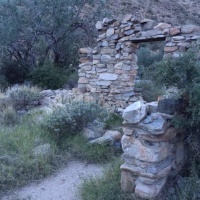 For you early birds, consider hitting the trail in the wee hours of the morning to catch the perfect view of sunrise from Wild Burro Canyon. If morning isn’t your thing, not to worry. The sunsets from that same spot are just as spectacular. While the location of this hike makes it a perfect destination, that’s not the only thing to recommend it. 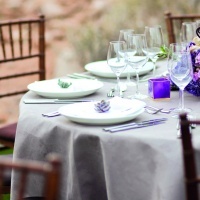 Next door to the trailhead is the Ritz-Carlton, Dove Mountain, complete with its three full-service restaurants ready to provide the perfect candlelit dinner. Highlighting their romantic offerings is Core Kitchen and Wine Bar, where you can enjoy a special three-course dinner menu featuring a trip to the Chocolate Lounge for an unforgettable dessert experience. Is a romantic dinner only part of the evening’s plan? Are you thinking of asking a certain someone a certain question? Then you have to be ready, and there’s no better place to outfit yourself for proposing that the Tucson Premium Outlets in Marana (which, happily, are just a few miles down the hill from the Ritz-Carlton!). There, you’ll find three different diamond retailers ready to help you find the ideal ring. Browse their wide selections of precious stones and perfect settings as you hunt down that one-of-a-kind ring that best captures the love you and your partner share. While you’re at the Outlets, don’t forget that the ring is far from the only accessory you’ll need for the big proposal. Grab a new dress from Banana Republic or a crisp suit from Saks Off Fifth. You want to look your best, because you know this memory will last a lifetime. Wedding locales across Marana offer unrivalled opportunities to experience this remarkable land. The Stardance Event Center, named for the celestial bodies cavorting across the night sky, lies nestled at the foot of the Tucson Mountains. With rustic barn doors on either side of its dance floor, twinkling light bulbs hanging from the rafters, a cavernous fireplace at one end, and a rough-sawn pine stage at the other, this classic space perfectly captures both the desert charms of Arizona and a sense of comfort you’ll treasure on this precious day. At your wedding, every detail matters, and that’s where Stardance really shines. A groom’s house with pool table and X-Box? Check. Wrought-iron chandeliers emblazoned with an old cattle brand? They’ve got that. Vintage farm tables festooned with old lace? No problem. Lawn area with majestic view of Mt. Lemmon? You betcha. Recently, Stardance has enjoyed a steady flow of couples from the Phoenix region. Owner and operator Kelly Abbott isn’t surprised, though, about this demand. Her venue offers all the same amenities as event spaces in Scottsdale, but without that swoon-inducing price tag. The only swooning she wants at her venue, after all, is when the happy couple seals the deal with a kiss. The perfect wedding means more than just a ceremony. It’s a multi-day experience of two families coming together, friends new and old getting to know each other, relationships old and young born and reborn. The Ritz-Carlton knows how important this moment is, and they’re going above and beyond to ensure that every second of your celebration is exactly how you’ve always imagined. At check-in, take a look at your room’s key card. Don’t be surprised if it’s monogrammed with the names of you and your partner! At the Ritz, no detail is too small. Having settled into your well-appointed rooms, your guests will want to start socializing, and the Ritz is ready to break that ice. They’ve got acres of space for sports days. They’ll put together a soccer field, organize egg-and-spoon races, and even coordinate geocaching across their grounds and beautiful surroundings. Their trained staff are at the ready to lead guided hikes or mountain bike excursions. They’ll host glow golf and stargazing at night. At dusk, a Native American flutist will perform the Spirit of Adventure, evoking the mysterious history of this stunning land. When it’s time for the big moment, the Ritz will meet and exceed your needs and expectations. Whether you’d like a spacious banquet hall resplendent in decor or an outdoor ceremony nestled into a canyon of the Tortolitas, they can create any ambiance you desire. For the reception, the only limitation is your own creativity. You can have a proper indoor or an adventurous outdoor feast inspired by the Wild Burro Canyon with your very own “Beer Burro,” delivering to your guests the brew of your choice. There’s also outdoor space for your favorite food truck to make a late night appearance. With all that dancing, your guests will love a quick midnight snack. With terrific summer and mid-week rates, the Ritz-Carlton also offers great deals for couples on a budget. Nothing is quite like a stay at the Ritz, and no wedding destination can match this resort for its combination of desert beauty and modern luxury. Go ahead, put on your Ritz! 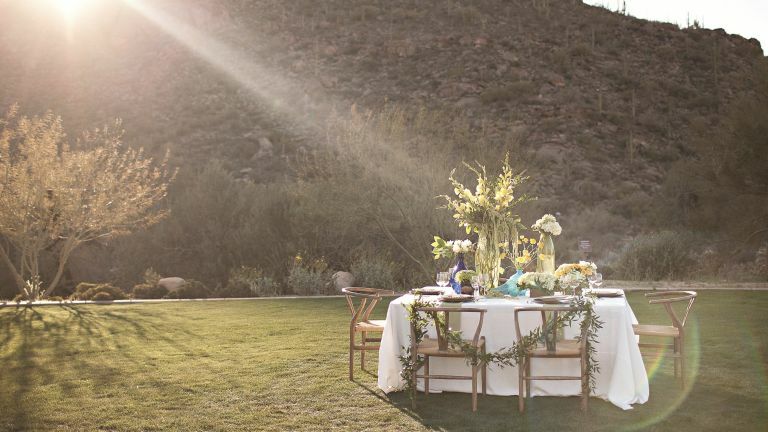 The Highlands at Dove Mountain may be the best kept secret wedding venue in Southern Arizona. The views are spectacular, the setting is classic, cozy, and just right. 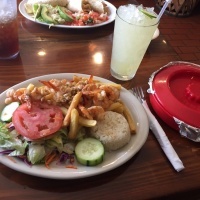 The food is exceptional and the professional staff will guide you through each step with ease. The Highlands has perfected the turnkey wedding package as well. If you don’t want to manage all of the details yourself, you can trust The Highlands to plan everything for you down to the florals, linens, cocktail hour, and menu. Maybe you want to have a perfect wedding and save your time to plan the perfect honeymoon? Once the romantic destination resort for Hollywood stars in the 1940s, Oasis at Wild Horse Ranch has retained its vintage charm and the convenience of multiple outdoor and indoor settings for all kinds of weddings (style, size, time of day, etc.) and weather. There are no worries here, only abundant character, intimate spaces, and secluded desert setting that will put everyone at ease. Oasis includes two outdoor gardens, a large patio, dining hall, dance floor, a full bar housed in a homestead-style rustic vine-covered stonehouse, a honeymoon suite, and vintage details. A waterfall and stream define the lawn where wedding ceremonies are staged. For some couples, a rustic chapel and beautiful mountains are all you need. For you, Marana offers Sanctuary Cove. 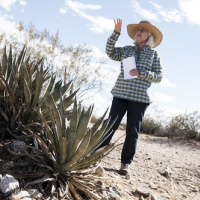 Tucked into the foot of the Tucson Mountains, this earthy setting boasts a number of options for you and your guests to get in touch with Mother Nature. A stone labyrinth presents an opportunity for introspection. 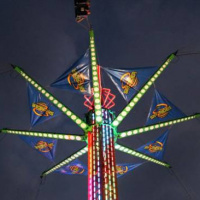 Wander through its coils as you contemplate the love you and your partner share. Intertwining footpaths crisscross up the hillsides, and a hardy pack of hikers will be tempted by Safford Peak, looming overhead. The locals call this igneous edifice Sombrero Peak, due to the wide-brimmed ring that circumscribes the summit. A wedding at Sanctuary Cove will offer you and your guests an experience you’ll never forget. A seat on a bench in the Cove’s amphitheater offers a sweeping view across the Santa Cruz Valley, with the Tortolitas extending to the north, the proud Catalinas straight ahead, the noble Rincons just behind them, and even the distant Santa Ritas to the south. As you and your partner make a lifelong commitment, not only will your family and friends bear witness, but seemingly, a vast desert landscape will look on as well. It’s a guest list that’s hard to beat. If an authentic, idyllic 1920s family farm and dairy with old tractors, stacks of hay, and 140 acres of trees and fields of grass and alfalfa is your style, you probably won’t find a cuter place that offers a warmer down home farm feeling than the Glover Ranch in Marana. Glover Ranch offers spaces for ceremonies, dancing, and farm-to-table style feasting for up to 100 guests. The views of verdant fields and distant mountains are stunning and serene. There’s nothing quite like the relaxed ambiance at Cocoraque. 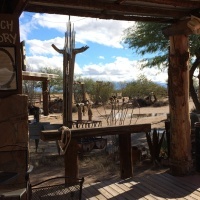 With all the beauty of our expansive desert sky overhead and distant mountains framing the landscape on all sides, this working ranch offers you and your guests a taste of the Old West. Their event space features a central stage, the perfect spot both for exchanging vows and do-si-do-ing afterwards. To one side is a three-sided pavilion, complete with oversized stone fireplace. Here, chow down on a meal of mesquite-smoked ribs, greens, and corn bread—this is the fuel that’s kept ranch hands going on this land for generations. As the evening wears on, your guests can take breaks from the dance floor at the bar, which is absolutely dripping with authentic flair. There’s nothing superficial about this saloon, a fact particularly evident from the row of cowboy hats that adorns one of the rafters. When you get married at Cocoraque, you often can avoid the hefty price tag that comes with an all-inclusive venue. Here, you’re just paying for the space, so you can pick your own caterer and band or DJ, provide the alcohol yourself, and walk away with a spouse and without a small mountain of debt. That’s a deal few cowboys can refuse. For some couples, simple means better. If your top priority is an easy location with plenty of open space and an affordable price, look no further than Marana’s own Heritage River Park. Under the auspices of Marana Parks and Recreation, this working farm features community gardens, rodeo grounds, and even a barn. The Town created this space in 2014 to celebrate Marana’s close relationship with agriculture. Since then, it has hosted two major fall festivals, farmers markets, and a grand opening of its new splash pad. In a lovely garden area surrounded by a miniature irrigation canal (a replica of the canals that irrigate fields throughout Marana) is a thoughtfully designed dance floor, complete with stage. Nearby, shaded tables welcome picnickers, and are the perfect spot to serve an al fresco wedding lunch or dinner. Marana’s outstanding year-round weather means that there’s little likelihood of rain. 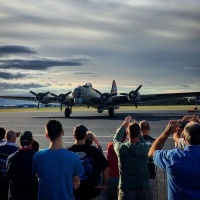 The forecast for an affordable and memorable wedding under the open sky is looking good! Marana: Come one, come all! 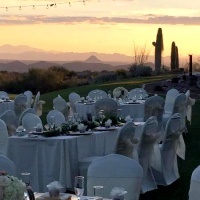 No matter what you envision for your special day, you’ll find it in Marana. With a dozen lodging options throughout the community, your guests will find the perfect room to suit any budget. The Town is also chock full of vendors ready to leap into action. 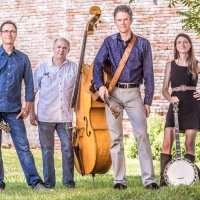 Marana’s community proudly supports the southern Arizona music scene by hosting an annual bluegrass festival every April. A number of talented musicians are on standby, waiting to play your reception. 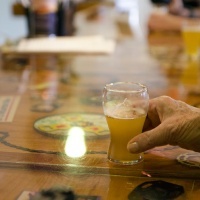 In Marana, you’ll discover a community that is full of adventure and surprises. From its stunning landscapes to the charming venues designed to showcase them, from delicious local flavors to creative activities for you and your guests, Marana is the ideal destination for your wedding. 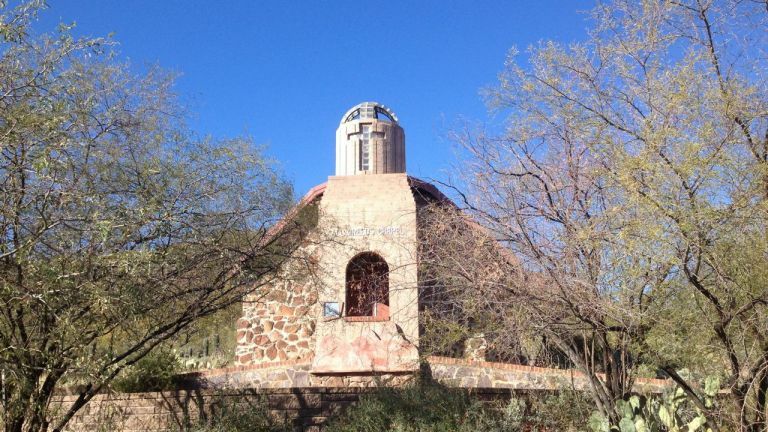 Get married in Marana, and the only thing you’ll love more than this Town is your new spouse!